Brīvais Vilnis is located on the right bank of the Salaca river, on the east cost of Riga Bay. Distance to Riga – 100 km. Back in 1949, a fisher collective farm “Brivais vilnis” was established in Salacgriva based on the decision passed by the Fishing Industry Ministry of the Latvian Soviet Socialist Republic. 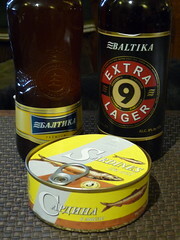 I scored this large round tin and beers at Euromix Delicatessen. The happy Eastern-Euro woman who was helping told me the sardines were Russian, so I gathered a couple of Russian Beers while I was there. Upon closer inspection they are from Latvia. I wish I was packing some Latvian beers, but considering the Soviet stomped the Communist Culture into this area through WWs 1 & 2, and then continued with their Occupation until 1989, I think Russian beer will suffice our needs. WHOA! These are Sardine Steaks, cut across the vertebrae, an inch thick!! Very different, I like it. 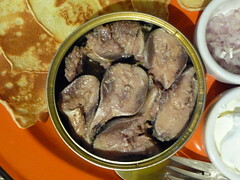 We're having this tin with blinis, sour cream, Tsar Nicoulai golden caviar (Pioneers in Sustainable California Caviar), and minced shallot. I am loving this combination. The blinis are delicious, the caviar (a fine yellow bubble), and a little shallot adds a nice pop, and sour cream a nice... creaminess, a great appetizer idea. These are some nice fish, really tuna like, good texture, nice flakiness. This is yummy all around. Maybe a little horseradish for spice next time (ours had long expired). The fish needs a cleaning as you go but well worth it. A Solid Three Tin Tin. 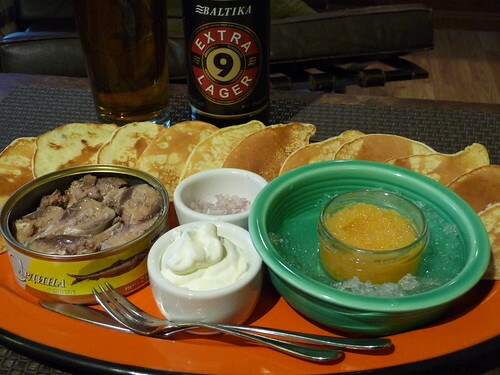 We drank the Baltika 8 (unfiltered wheat ale (sic)) while GG prepared the blinis and I loved her from across the room. I try not to take a lemon in my weissbier but this one comes on clean and sweet, without a sourness I look for, so I sliced one up. Huge head, cloudy and light bodied with a little banana happening. This is corporate beer from St. Petersburg, but it's tasty and they have an interesting number system for their beers. 0 - 10. With the platter I had the Baltika 9 (extra lager, 8%). Meh, strong lager, should have save the 8 to go with the food. This sounds great. You're motivating me to eat sardines more.